How long have Aborigines lived in Australia? How long have Aborigines been in Australia? The answer commonly given is 40,000 years. Depending on which evolutionist is telling the story though, it could be 50,000 or 60,000 years—or even longer. This Aboriginal rock painting of a rifle is known to have been painted in recent times, yet other paintings in the same park are claimed to be thousands of years old. Click for larger view. It should be remembered that such claims are always based on many assumptions (beliefs which cannot be proved to be true). In respect of radiocarbon dating, for instance, it is assumed that the earth’s production and decay of radioactive carbon are in balance (as long-age theory says they should be, but observation says they are not). A radiocarbon ‘age’ of say 30,000 years may thus actually represent a true age of only a few thousand years. When this erroneous age is assumed to be true, it is then used to assign an even older date to something found at a lower level, and so on. It is instructive to visit a site such as the famous Kakadu National Park in Australia’s Northern Territory, where the well-known ‘X-ray’ style of rock paintings can be found. Modern house paint lasts only a handful of years, yet the visitor to rock-painting sites is told that many of these applications of a simple mixture of ochre and water are tens of thousands of years old! Some of these ‘ancient’ paintings have had a silicon strip or dripshield applied around their rim to deflect water run-off, as they have been observed to erode quickly when it rains. Of course, they may have been touched up from time to time, but to assume this happening consistently for tens of thousands of years further begs the question of whether these great ages are real. In fact, in another part of the same park one finds paintings of Europeans smoking pipes, and of sailing ships. 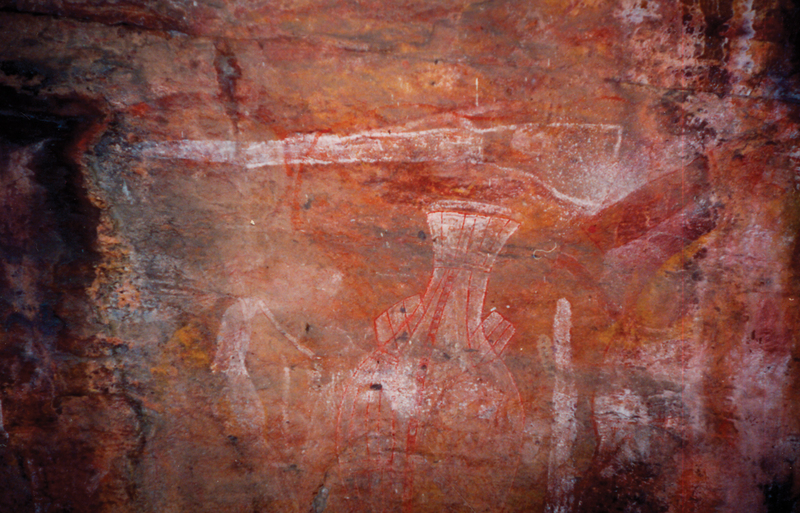 The photo (above) shows a Kakadu painting of a rifle. Naturally, everyone is forced to accept these as ‘recent’. The incongruity is glibly passed over by referring to it as the ‘world’s oldest unbroken record of continuity of art’ or something similar. But the creationist explanation, that all the paintings are at most several centuries old, fits the facts at least as well—with no awkward contradictions like the fact that these rock paintings are seen to erode quickly in the absence of manmade dripshields. Evolutionists sometimes say that at least some of the Kakadu paintings must be tens of thousands of years old, because they show animals which became extinct tens of thousands of years ago. It seems obvious, however, that one evolutionary assumption is being used to prop up another. It is perfectly feasible that the animals in question only became extinct a few centuries ago. Evolutionists are forced to ignore or downplay other evidence that the Aborigines have been here for a much shorter time-span. There are also other Aboriginal stories which appear to be corrupted memories of the time before they separated from other peoples at Babel—for example, accounts of the creation of man and woman, and the dispersion of tongues at Babel. The stories of one tribe insist that this incident happened not in the Middle East, but near Cooktown, in Australia’s Far North Queensland.3 Not surprisingly, they have no cultural memories of Jonah and the fish, or of Moses crossing the Red Sea; it all ends with Babel, and they didn’t get it from the missionaries. If in fact it turns out that there are no post-Babel stories in this ‘biblically inspired’ rock art, the theory that they were inspired by early Christian contacts would be hard-pressed to explain this. Why no New Testament motifs, for instance? It would be much easier to explain as just one more example of the Aborigines’ memory of the Flood. Modern biology has also revealed that the old evolutionary racist belief, that Aborigines have large biological differences from Europeans because of long periods of isolation, is no longer tenable. God has indeed ‘made of one blood’ all nations of men; it is now common knowledge that the genetic differences between all the various races are so minor that they can be represented as a series of very closely overlapping circles. Unfortunately there is a strong emotional component to this issue of the Aborigines’ allegedly long stay. Unfortunately there is a strong emotional component to this issue of the Aborigines’ allegedly long stay. The perception is that 40,000 years somehow makes the Aborigines’ dispossession more immoral than if they had been here for only 2,000 or 3,000 years. The ‘ancient’ theme has also become closely linked, in Australia, with black pride and land rights, not to mention the added mystique (and therefore commercial appeal) when marketing such things as Aboriginal art and souvenirs. Even Aboriginal rock music of late has been given the ‘40,000 years’ hype treatment to help it sell. Under such ‘fashionable’ social pressure, it is no wonder that each new ‘dating’ of the Aborigines seems to just keep growing older and older. In reality, the weight of evidence is consistent with the fact that the Aborigines, as descendants of Noah’s family,5 and thus close cousins to the rest of humanity, have been here only a few thousand years—certainly less than four thousand. Christ died for all the descendants of Adam—whether Aborigines, Europeans, American Indians, Africans, Eskimoes or whatever the label; ‘for all have sinned, and come short of the glory of God’ (Romans 3:23). Fully referenced in The Revised Quote Book, Creation Science Foundation, Sunnybank (Queensland), 1990, p. 23. Return to text. See, for instance, The Flood, Creation 4(3):9–12. Also, Funk and Wagnall's Standard Dictionary of Folklore, Mythology and Legend, New York, 1950. Return to text. George Rosendale (Aboriginal Lutheran Pastor from Far North Queensland), personal communication. Return to text. 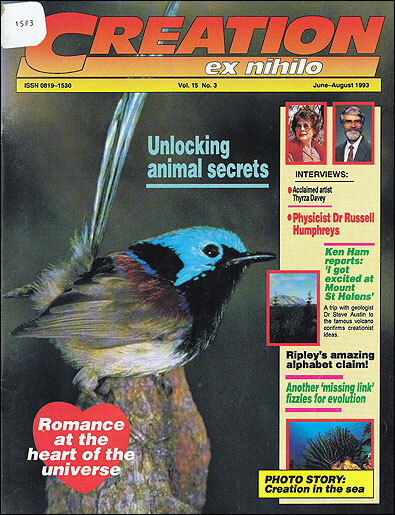 The Courier-Mail, Brisbane (Australia), 10 February 1992. Also G. Walsh, personal communication. Return to text. See the chapter on the origin of races in The Answers Book for a detailed explanation. (Ken Ham, Andrew Snelling, Carl Wieland, The Answers Book, Creation Science Foundation/Master Books, 1990, chapter 8.) Return to text.